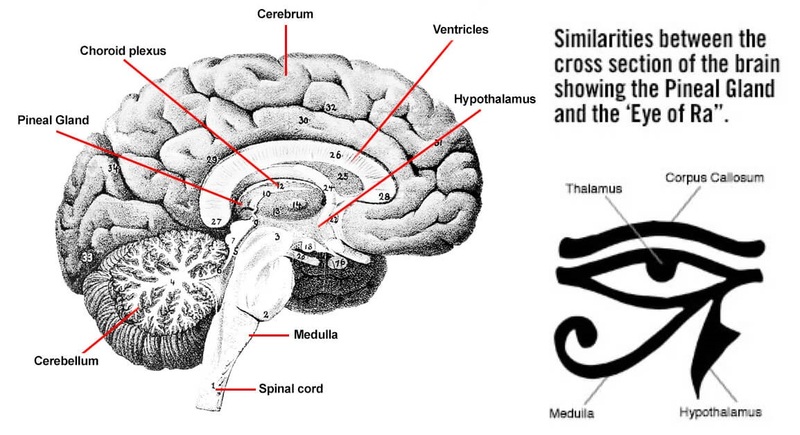 In the wake of an overwhelming response to my previously written post about experiencing a spontaneous third eye awakening, this post will cover the scientific aspects of the pineal gland, which is commonly associated with the term ‘third eye’. What topics are going to be covered in this post?With so much information, and misinformation, out there about the definition and functions of the pineal gland, it’s only fair that we list the main topics that are going to be discussed and explained throughout this post. You can scroll and read through each one individually, or if you prefer just read the topics that are important to you. What is the correlation of fluoride and pineal gland? How to decalcify your pineal gland? How to stimulate your pineal gland? It’s quite a bit of information, so please bear with us if some parts end up being clunky or not fully clarified, through your feedback and questions in the comments we can ensure that the post is adjusted to reflect the best and clearest scientific and spiritual advice on how to keep your pineal gland healthy and functional. Before I begin, I would like to express my gratitude to Caroline Cousins who inspired me to make a revised edition of this increasingly popular subject. Caroline’s an intuitive therapist who has more than two decades of experience in working with energy healing, and she is a certified energy healer in many modalities. If you’d like to learn more about her work, please visit her website at The Transformational Energy Expert, where you can also explore the ways she can help you with overcoming life transitions and ease the process of tuning into your own intuitive abilities. The pineal gland, which sits at the centre of your brain, is responsible for the production of a serotonin derivative known as melatonin; a hormone that helps to regulate and maintain a healthy circadian rhythm (which regulates your sleep patterns), but also helps to regulate reproductive hormones for female gender. During the dark hours of the night, the body’s ability to produce melatonin increases greatly, whereas during the day the production levels are low, hence you don’t feel sleepy or tired. Whenever you expose yourself to bright light during late hours, the normal cycle of body’s melatonin production is disrupted. This applies in particular to those who work different shifts at work, or frequent flyers who hop between different time zones frequently. Your pineal gland has the highest ratio of serotonin (as quoted by Rick Strassman) anywhere within your body, which is a critical component for the production of pineal melatonin. Serotonin, as you may have heard, governs your energy and mood levels, and is often called the neurotransmitter of happiness and confidence. Doing tasks that challenge you to great extents and provide a sense of achievement are all linked with a greater production of serotonin which helps you to keep going. During the 1950’s scientists concluded numerous studies on the brains of rats and mice, and found that both contain significant amounts of DMT, during that time scientists were also able to find enzymes that form DMT from tissue samples of human lungs. Then in 1965, a group of German scientists published a paper that showed the extraction of DMT from human blood. In 1972, Julius Axelrod, who was an American biochemist, confirmed the presence of DMT within the tissue of human brain. 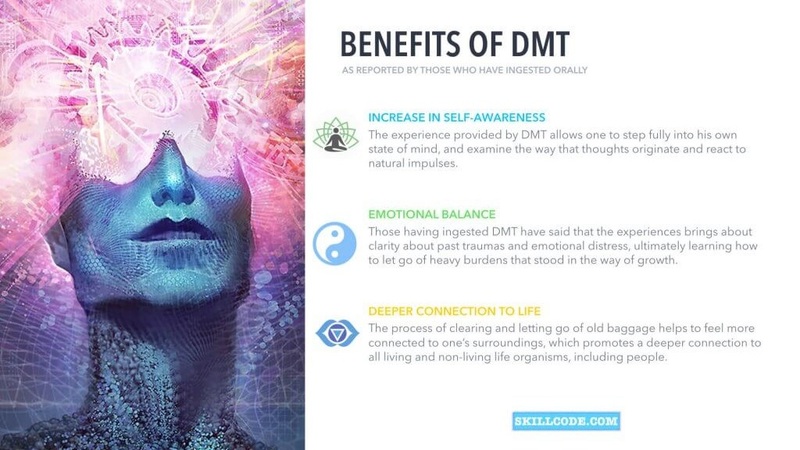 While the function of DMT within the human brain is currently unknown, Dimethyltryptamine (DMT) is one of the most powerful psychedelic drugs, which happens to occur naturally in animals, plants, and the human brain. When consumed orally, DMT is reported to initiate a strong psychedelic, and often spiritual, experience for the mediator. This is also part of the reason why there are so many questions around the correlation of the pineal gland and DMT production, because at the moment DMT is classified as a Schedule 1 drug, which is quite ironic if you consider the fact that it naturally occurs in the human body! However illegal in the United States, the consumption of DMT has deep roots within the culture of South American shamans and natural healers. While there aren’t many scientific studies yet that show the therapeutic benefits of consuming DMT, numerous selfless seekers — who have found themselves challenged with lifelong fears, depression and anxiety — have taken it upon themselves to head into the South American jungle and try magical brews like Ayahuasca and San Pedro for themselves, and no matter how many reviews and testimonials you read, it seems that by the time the experiences are over, there is along lasting relief from emotional trauma, alleviation of issues relating to PTSD, and one generally experiences a profound sense of well-being. We live in a world where the Western society has yet to embrace the natural healing that is possible thanks to a large variety of plants on this Earth, perhaps things will start to shift gears once people begin to understand that the human body is a fastly adapting organism that can build great tolerance against chemical drugs meant to aid in depression, stress, and other emotionally-related issues. Whether we want to believe (accept) that a naturally occurring substance such as DMT can induce a spiritual experience is up to all of us individually, but searching for “DMT reviews” and “DMT trip reports” gives us a large variety of experiences to work with, to notice common patterns and similarities that can help to understand the function of this psychedelic substance. What are the most common experiences that people have when ingesting DMT orally? Below are our findings, gathered through numerous personal studies and reviews. Feel free to comment with your own experiences in the comments section or join the conversation on Facebook. The findings are surprisingly identical to that of a meditation practice, those with a regular meditation practice will report the same benefits as outlined above. Which comes back to what was said earlier, that serious meditation practitioners can flood their own brains with DMT and avoid having to ingest DMT directly. We have still more to go, and we will explore ways that one can stimulate and activate his pineal gland later on, but for now, another “controversial” topic of discussion is the effects that fluoride has on the pineal gland. As you begin to grow older with age, your pineal gland starts to calcify, and lose some of its potent functionality. These statements differ based on the lifestyle choices of each individual, but ingesting too much of fluoride is known to be an important factor in how fast the pineal gland gets calcified. Research compiled by Mercola shows that fluoride might not only cause cancer, but fluoride can also lead to devastating diseases like Alzheimer’s — which is directly linked with the body’s inability to produce melatonin because of a calcified gland: fluoride reduces the production of melatonin. There have been great outbursts of anger towards the governments in countries like United States, which have admitted that the fluoride levels in water are way above their norm, and have since taken the appropriate steps to reduce water fluoridation. It hasn’t, however, stopped people from deeming this situation as a conspiracy to control people, which in all fairness isn’t so far fetched, given that DMT — which is found in the human body — is labeled as a Class 1 drug. Which substances calcify the pineal gland? You may want to start cutting down on the following substances, so that you can start the process of reversing the effects that calcification has done on the effects of a healthy gland. To begin the process of decalcification, you will need to inform yourself about the most harmful substances that cause your pineal to calcify in the first place. As a general rule it considered that, those who consume a poor diet are more likely to have their gland calcified than those who stick to a healthy and organic diet. Always check if your toothpaste contains fluoride, Colgate might have a great marketing record, but it’s not the most optimal or healthy choice for your gums. Seek alternatives, and explore options like coconut oil which promote healthy teeth and gums. Intaking large quantities of calcium that comes from processed food, and supplements, leads to large amounts of calcium phosphate that stores itself in your system. Avoid tap water at all costs, use a filter (and make sure it filters fluoride) whenever possible, but the best thing is to drink clean mineral or spring water, which isn’t near the cost of having your health go down the drain. Avoid foods like shark fish, swordfish, king mackerel, tilefish, also high fructose corn syrup — which research has shown to contain significant traces of mercury. Spirulina & chlorella are great additions to your diet that can cleanse your system of any mercury. Majority of food in the supermarket was grown in a toxic environment which uses chemical pesticides to stimulate the growth of food, including a diet additive of growth hormones for animals. Consider changing your diet so that it includes organic and environmentally friendly vegetables. Genetically Modified Organisms are a source of cancer and disease within the body, avoid at all costs and always check your food labels, preferably change your routine to shop at whole foods and organic markets. Anything artificial is going to contribute to your overall health and the health of your pineal gland. Refined sugars, chemical mouthwash, artificial foods, and other chemical “household” items will detriment your health. Harmful substances such as non-organic sugar, tobacco, alcohol and caffeine are known to reduce energy in the body, which allows for toxins to store themselves in your system. So, one has to ask himself, what kind of steps are there to take in order to reduce the calcification of the pineal gland (apart from beginning to reduce the consumption of the mentioned substances above), and more so, how to improve the function of the pineal so that it remains healthy? You should by now have enough information to understand the purpose of the pineal gland, the effects of DMT, and the way that fluoride and other chemicals stand in the way of a healthy and functional pineal gland. For example, you can walk into any food supermarket today, and after checking the labels only of a handful of items you will become aware of the mass-production of food that is happening in the world today, as most food items contain numerous chemicals and substances that we listed as dangerous to your health. The price of healthy food is far more affordable, than the price of your own life because of a disease that can be prevented through a mindful change in your diet. The following list of items is dedicated to informing you about foods and approaches that can help in the process of bringing your gland back to its full health. We can’t emphasize enough how important it is to make a switch to a more healthy, and organic diet. Raw cacao, beans in particular, are full of antioxidants that keep your brain healthy, which can help to keep your body free from pesticides. Cold pressed virgin coconut oil is the best. The triglycerides that come with coconut oil produce ketones in your liver. Ketones can aid in restoring nerve function in your brain, and heal damaged neurons. Spending time outside in sunlight can help to improve your serotonin levels. The light produced by sun is a natural trigger of serotonin production within the pineal gland. Keep your exposure to light during night hours to a minimum for an optimal sleep cycle. Raw apple cider vinegar contains large amounts of malic acid, which is a powerful detoxifier for your body, whilst being of great assistance to your digestion. Always check the source of your water, those with experience in decalcifying recommend to drink pure spring water whenever possible. Eat raw, organic and healthy food to give your body the most optimal nourishment. Don’t wait for the right moment, and start to incrementally change your diet patterns. You will be surprised how quickly the cravings for poor-quality chocolate start to disappear. Meditation, yoga, chanting, and a mindful approach to life will all help to stimulate your pineal gland. A happy brain is a positive brain, so do your best to remain positive in life, and influence your own life experience through a healthy way of living. Iodine supports healthy function of your thyroid, but also helps to keep your pineal gland clean by flushing out any sodium fluoride in your body. Seaweed, dark greens, kale, and green beans are all foods rich in iodine. You now have at your disposal, both sides of the spectrum. The things that damage your pineal the most, and the things that help to keep your gland healthy. You might not see instantaneous results, but gradually as your health improves you’ll have a much easier time to make a connection with that tingling feeling at the centre of your forehead. Meditation, yoga, fasting, and an Ayahuasca ceremony are all extremely potent ways to get in touch with your third eye. Having written about the ways that meditation can be used to stimulate your gland, it’s of little use to rehash the same story again. Other writers have put together concise explanations of how to stimulate the pineal, one of which you can read here on Wake Up World. By combining together a mindful approach of detoxifying your body of toxins, changing your diet to an organic one, and using visual meditation techniques — you will inevitably be able to make the third eye work for you. Spirituality is a tough topic to depict, and majority of what you read about these subjects comes from people’s own experiences. Luckily for me — I never had a problem with embracing natural phenomena occurring in the body. All living plants have traces of DMT, scientists have proved that different parts of the body contain DMT, what else is there to know before we start to embrace ourselves as humans who are possible of more than meets the eye. You can learn more about Alex here, and visit his website at skillcode.com.